Some sandwiches don't translate well from savory to sweet. 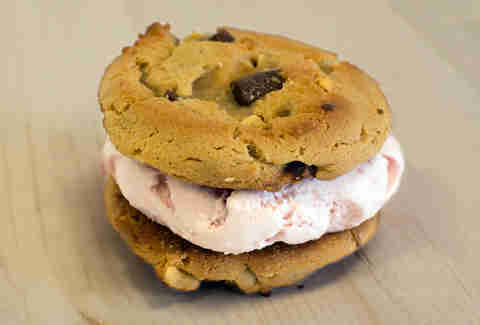 PB+J was born to, so get a scoop of Very Berry Strawberry between two Peanut Butter Chocolate cookies when you decide to invoke the most sacred of your adult privileges and have ice cream for lunch. Continuing the savory to sweet sandwich riff, substitute the Very Berry Strawberry with a scoop of Rocky Road for a taste of childhood nostalgia. And marshmallows, duh. Missed making a cookie order with a local troop this year? 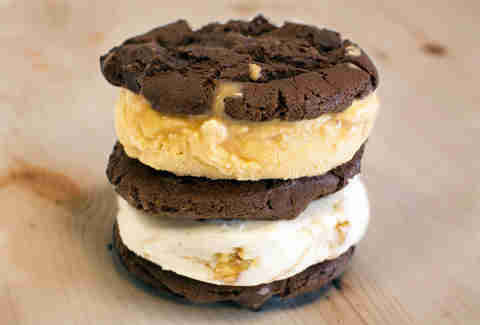 Get a double ice cream sandwich and stick a scoop of Nutty Coconut and Dulce de Leche between Double Fudge cookies. Give your ice cream sandwich an elegant spin by stacking a scoop of Green Tea on top of Vanilla with White Chunk Macadamia cookies to perfectly balance hot and cold. Ice cream with a hint of zen. 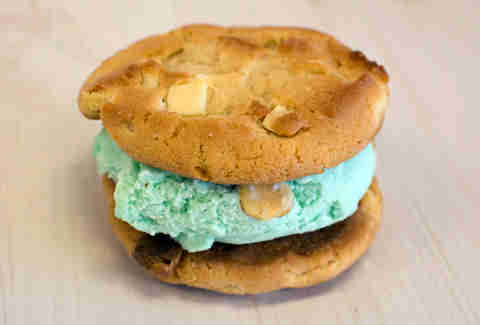 If you're feeling a little nutty (har har) by the end of the day, don't fight the feeling -- embrace it, along with a scoop of Old Fashioned Butter Pecan and Chocolate Almond ice cream between a White Chunk Macadamia cookie and a Peanut Butter Chocolate cookie. Go nuts (haaaaar) and throw some chopped almonds while you're at it. 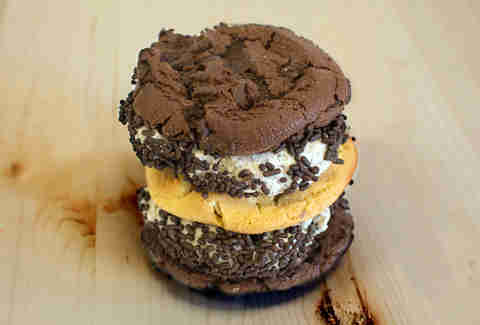 It's like the biggest OREO® you've ever gotten your hands on: slide a scoop of OREO® Cookies 'n Cream between Double Fudge cookies... and then throw in some Peanut Butter 'n Chocolate ice cream because OREOS® taste incredible with peanut butter and why would you just stop at "the biggest OREO® you've ever gotten your hands on." Dream big. 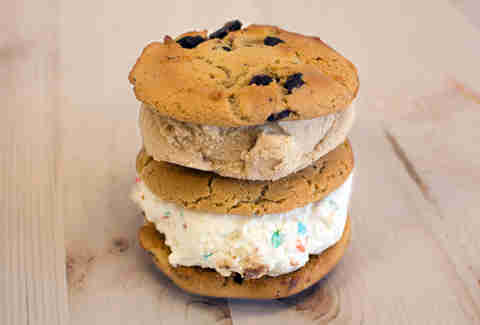 Like double ice cream sandwich big. Making baklava yourself is a long and messy process. For those of us that don't have the time and experience with baking Greek desserts, approximate that flavor with a scoop of Pistachio Almond between White Chunk Macadamia cookies. It's delicious, classic, and typically made with sponge cake. We say, throw out the sponge part of that equation and remix the brunch staple with a scoop of Icing on the Cake to add (the confetti really does make it taste better) to Jamoca®. And then share it with us. Please. 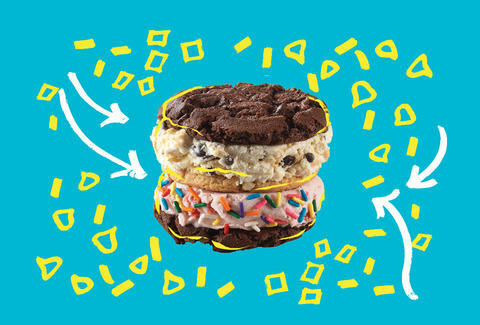 Technically speaking, there's way over a hundred ways to eat an ice cream sandwich at Baskin-Robbins, but bite into the 102nd of them for a proper mix of varying tones of chocolate and vanilla that will leave your tail wagging. Babka bread & cake in Eastern Europe tends to contain raisins or a drizzle of rum syrup, while babka on the East Side is usually best known in its chocolate incarnation (love that babka). 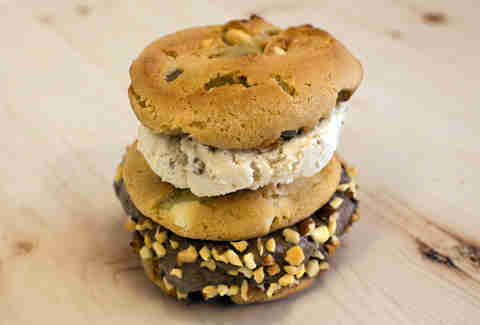 We propose mixing the two traditions with a scoop of Rum Raisin between Double Fudge cookies. Bubbe would approve. Why wait until 5 o'clock somewhere when mojito cake is acceptable at any time of the day (even 6 in the morning... stop looking at us like that). Recreate the fresh bite of this dessert with a scoop of Mint Chocolate Chip and scoop of Rum Raisin ice cream between White Chunk Macadamia cookies. 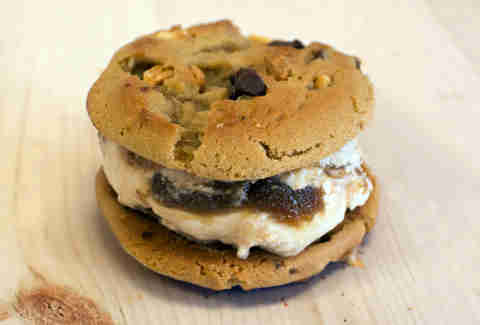 Questionable tastes in white jumpsuits and home decor aside, the King did have excellent taste when it came to food, which we think is worth honoring in ice cream sandwich form -- some Bananas Foster between Peanut Butter Chocolate cookies in imitation of his famous favorite sandwich. 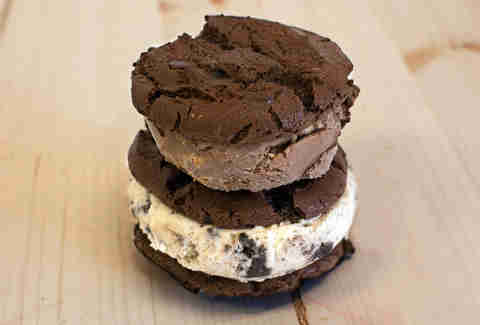 Cutting back on coffee is a perfect opportunity to lean in on coffee ice cream. Throw in some Green Tea on top of Jamoca® and Dark Chocolate Chunk cookies when you're looking for a little more pep in your step. 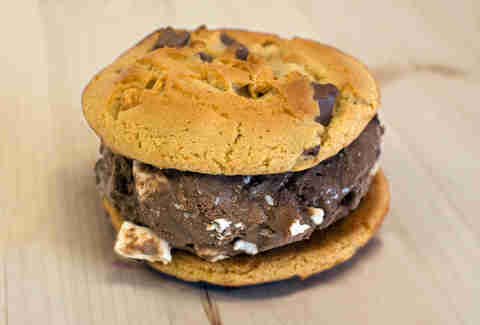 Or ice cream in your mouth. Unless you're toting around coffee to soften their crunch, biscotti aren't that enjoyable on their own. Break away from the beverage and recreate the flavor with Jamoca® and Pistachio Almond ice cream, throw it between two soft Double Fudge cookies, and top it off with chopped almonds. Your molars will thank you. 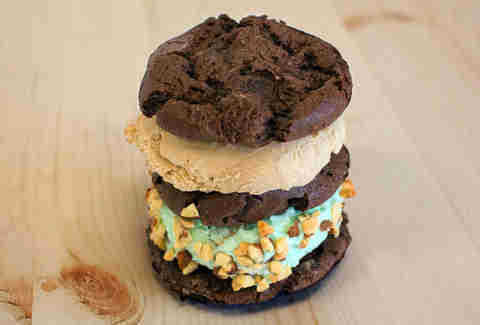 If you want a truly money flavor, mix the refreshing bite of Mint Chocolate Chip with World Class Chocolate ice cream -- the mint will perfectly counterbalance the richness of the ice cream and the Double Fudge cookies.